Editor's Note: In this new series of blogs that we're calling "Fresh Ideas," we'll be sharing a variety of resources for different subject areas, and we hope some or all of these will be new to you. If there are topics you'd like to see covered, or if you have suggestions for resources that should be included, send a note to: eweiland@teachingchannel.org. When it comes to lesson planning, it can be a challenge to make information feel fresh and exciting (for both teachers and students). In an effort to mix things up, we're taking a look at some novel approaches to teaching a variety of subjects. 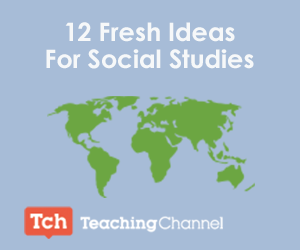 In this blog, we’re looking at resources for social studies. You probably won't be able to incorporate all of these resources into your classroom, but hopefully they’ll spark your creativity and inspire you to think about your curriculum in a different way. Have more fresh ideas? We'd love to hear about them! Share your own classroom successes in the comments section below. 1. The Sport of Life and Death: This site won a slew of awards for its thorough and interactive examination of life in ancient Mesoamerica. The website provides a history of the region, as well as suggestions for in-class projects, and a game that assesses what students have learned. 2. Mummify a Chicken: Yes, you read that correctly. With a few inexpensive ingredients, you can demonstrate firsthand how the ancient Egyptians prepared and mummified human remains. This is a somewhat long-term project (and not for the squeamish), but certainly memorable. It's also an effective way to pair social studies with science. 3. Dictator for a Day: This exercise allows younger students to explore the pros and cons of a dictatorship. The lesson plan provides various ways to configure this activity so that it is inclusive and instructional. 4. Well-Behaved Women [and Men] Seldom Make History: Students read grade-appropriate texts about historical figures, and then use a graphic organizer to compare and contrast these individuals' stories and the effect they had. This is a great way to teach historical context, and can be adapted to any period of history. 1. Crash Course: Crash courses with dynamic brothers John and Hank Green. This YouTube channel offers hundreds of colorful, fast-paced, insightful videos organized into the following courses: literature, psychology, chemistry, ecology, world history, US history, and biology. 2. Studio C: A light-hearted take on how history and culture can shape the relationships between countries. It could be fun to have students research certain countries and create similar skits, incorporating what they’ve learned. 3. Making the Declaration of Independence Come Alive: Study the Declaration of Independence -- with a twist. High school students in particular will enjoy this fresh look at the purpose of the Declaration. 4. Mystery Skype: An educational game invented by teachers and played by two classrooms on Skype. The aim of the game is to guess the location of the other classroom by asking each other questions. It's suitable for all age groups and can be used to teach subjects like geography, history, languages, mathematics, and science. 5. iCivics: Founded by Justice Sandra Day O’Connor, iCivics is a seriously cool site that offers lesson plans, curricula, supporting materials, and games to teach students about how government works. Another excellent site related to civics is Generation Citizen, which encourages students to participate in the democratic process. Generation Citizen provides teachers with a Common Core-aligned, action-based civics curriculum, a trained college co-facilitator, and supplementary resources to help create meaningful, hands-on experiences for their classes. 6. The Smithsonian's IdeaLabs on Artifacts and Analysis: This site presents a strategy for incorporating historical artifacts and documents into the teaching of US history. Designed as a companion to the Advanced Placement Program US History course, it is also effective in any instructional setting that emphasizes analytical thinking and writing. 7. Teaching History with Political Cartoons: This is a very visual way to have students grasp historical events. While most of these examples from the Library of Congress are from the 18th to 20th centuries, students could also compare and contrast political cartoons from the present day -- and perhaps draw their own cartoons. 8. Simulations and Role-Playing: One way to bring history to life is to assign students the roles of historical figures and have them debate a unique issue from the time period. For ideas on specific scenarios, as well as an online tool to help develop arguments for the debate, check out the SCAN tool. Share your own fresh ideas in the comments section below. Unfortunately, the SCAN tool mentioned in #8 is no longer available.